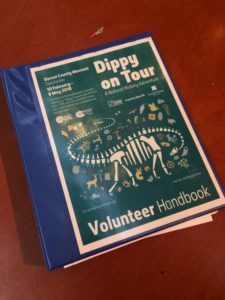 Hi – my name’s John, and welcome to my first blog about volunteering to help out as Dippy Does Dorset in 2018. The famous “Dippy” the Dinosaur arrives at Dorset County Museum next February. This is my behind-the-scenes take on the build-up to his arrival and unveiling, which will see up to 70,000 people, including over 6,000 school children, come through the doors in the space of just 10 weeks. Tickets are free but timed, to manage the amount of people who’ll visit at any one time and to ensure that everyone goes away with a fantastic experience! It’s the legendary dino’s first stop on a nationwide tour from London’s Natural History Museum. It’s a massive honour for Dorset but pretty fitting, I think, as the county is home to the unique Jurassic Coast World Heritage Site and is the ‘birthplace’ of fossil hunting and modern earth science. 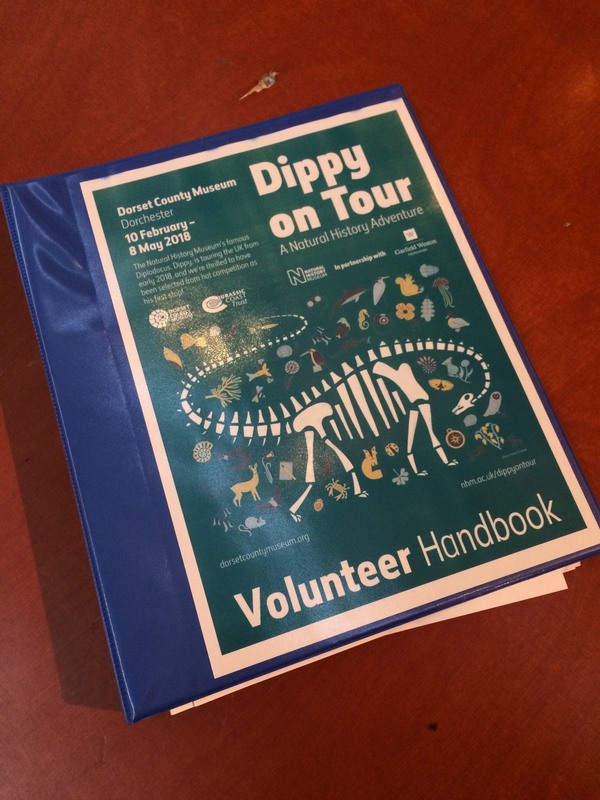 When I found out Dippy was coming I put my name in the volunteering hat straight away. I remember the sheer excitement of my children when we took them to see Dippy in London a year or so ago. All the kids were the same – Dippy was the star attraction and everyone wanted a selfie. As Dippy Does Dorset, it’s a great chance for our local kids and those a bit further afield – we’re the only tour date in the southwest – to see such an amazing creature. Of course I might be a bit biased after growing up on the Jurassic Coast collecting fossils from Lyme Regis to Portland and taking ‘beach studies’ (as my friends call it!) at Uni. I now also run a family business called OCEANROCKS producing environmentally friendly t-shirts and related accessories all inspired by the Jurassic Coast. And we’re proud to be Business Partners of the Jurassic Coast Trust and do what we can to promote our amazing area. It turns out about 200 other people feel the same as I do and also want to be part of Dippy’s visit. 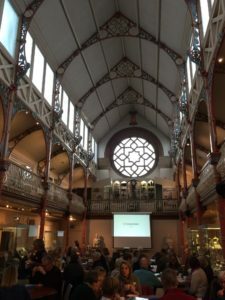 In November I joined a good mixture of them at a training day at the museum to find out what is in store for us as volunteers. 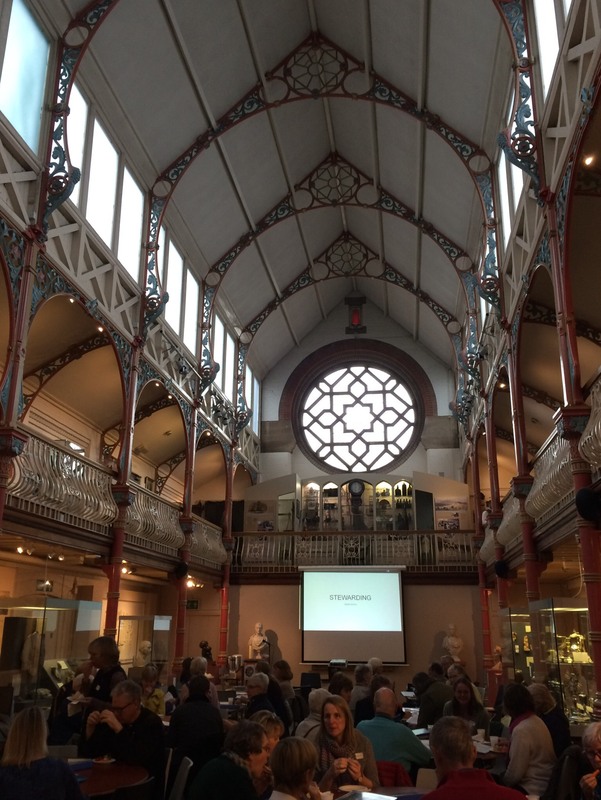 We gathered in the main Victorian Hall at the Museum where Dippy will fill the space with a clearance of just 15 cm from the wall at either end. I wouldn’t like to be the person who wielded the tape measure if the giant Dino doesn’t fit! All existing exhibits will be cleared out and information displays put up around the space. There were plenty of retired folk – as you might expect – but also full time workers using holiday allowance so they could help out. Others included an ex-teacher who had once lived in London and has already led countless school trips around Dippy at the Natural History Museum. For some it was their first stab at volunteering, whilst others were seasoned professionals. One experienced volunteer is Paula Harding who, like many of us, has signed up for any role where the museum needs help. I’ll be helping out with school trips and acting as a ‘Steward’ when Dippy Does Dorset, to help visitors move smoothly through the building. I’ll also be helping to make sure Dippy doesn’t getting damaged as he’s actually insured for £1 million! It sounded like there was a quite a lot of red tape and negotiation needed to bring Dippy to Dorset. The museum’s Commercial Director David James explained that it got down to fine details like a glass of white wine being allowed in the same room as Dippy but a not a glass or red wine. I know a few people with the unfortunate habit of knocking over the odd glass of red wine or two so will keep them well clear! It was quite clear to us all that the most important part of the stewarding role was, as the David put it, “to enable all our visitors to have the best possible visit to Dippy”. I was excited before I went to the volunteer day and I wasn’t disappointed. It is going to awesome with a few surprises along the way too! A massive amount of work has gone into bringing Dippy to Dorset and much more is needed still. If you want to visit when Dippy Does Dorset, it’s free but booking is recommended – check out the museum website. You can also join up as a Go Jurassic! Rangers family to access exclusive Dippy on Tour rewards. I hope you’ve enjoyed reading my first blog – any feedback much appreciated! Next time I’ll share some more about Dippy’s story and what’s happening behind the scenes. If you’ve enjoyed reading this blog, you can also find more of my posts about life on the Jurassic Coast at www.oceanrocks.co.uk/blog and www.oceanrocks.co.uk/ourstory.